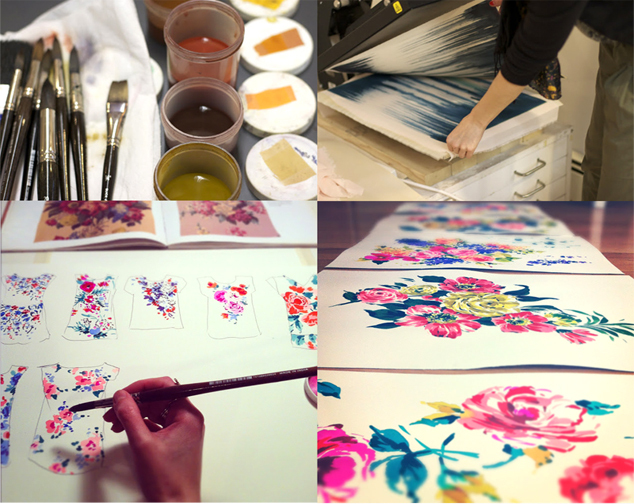 Woking Girl Designs: Florals in textiles- Take a basic class. i wish i lived in New York so i could come to this!! Hi Julia. I use a mix of mediums, but usually I use Luma color inks, they are discontinued but you can find similar by Dr Martin in most art stores. thank you for this info! it helped a lot and its great to work with them! do you know of any similar workshop to yours in the Uk? Thats amazing! How much are the classes? How long each day? HI there! The June class is from 11am-5pm on Sunday June 2nd. You can check out pricing on the Textile arts center web page ( see link ) in the post! Thanks! Hope to see you in June! Thanks! I was able to find the class unfortunately its already full though I am on the waiting list. Do you plan to do any more workshops in the upcoming months? Ah, thats a shame. I don't have any planned classes, but I'll post on the blog as and when i do! Thanks! Hi! I saw that the June class is full. Will you be having another any time soon? Hi Dena, I'll keep you posted, nothing planned yet but keep an eye on the blog for more updates! i just found your site any courses in the near future?